The day the stranger came to Vidar, everyone was excited. If she could find a way through the blizzard, maybe…maybe there was a chance we could escape. The Stranger was not the savior of Vidar. 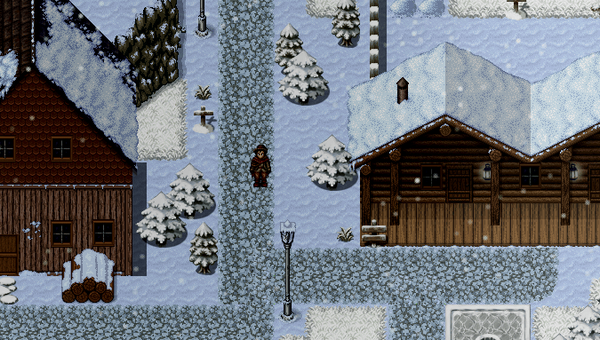 That is the beginning of Vidar, an RPG video game focusing on narrative and character development as well as complex environmental puzzles. Vidar is the name of the town where the game starts, a town that faces a horrible threat: A Beast lives beneath Vidar. Your mission is to reach it, and for that, you will travel the ruins of Old Vidar, a once glorious city, filled with challenging puzzles. The exciting thing is every time you start a new game, the puzzles will change… But the challenge does not end here, in Vidar every night a person dies and only 24 villagers remain. You have 24 days to reach the Beast or everyone will die… Could you save Vidar? Vidar handles over 6,000 lines of dialogue by 24 NPCs who react to each other and events in new and complex ways. The quests and the story are responsive not only to your decisions but also to a random chance. That means the story will be completely different every time you play the game from the beginning. The developers, Razbury Games, have used ChatMapper to manage the game’s storylines and implement non-linear and interactive dialogue. As TeachRaptor says: “This is a game that is approaching storytelling in a different manner than others do, and it does so in an intelligent, thought provoking manner”. The games with a strong storytelling have something unique to hook the player: The player becomes the character and decides what happens next. There is nothing more exciting than feeling that you are in control that the destiny is in your hands; your decisions matter! Then, there comes the moment when the player forgets he is playing a game and discovers himself in a whole new universe… Congratulations! Your player is now the character, you managed to get them to identify with the story and the characters’ destinies and by doing this, you managed to get the hooked on the game! If besides that, your game is different each round, offering new experiences or possibilities, you may have an amazing and unique game. A big and important part on how to achieve that? With a non-linear dialogue tool! Dean Razavi, Vidar’s game designer, will be giving a class to teach developers how to use ChatMapper to develop complex and branching conversations in games. It will be on Monday, December 5 in New York. 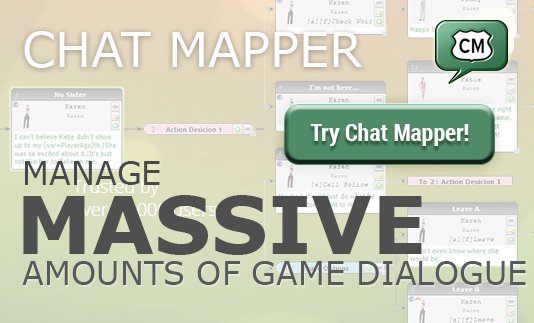 If you want to learn how to develop games with a tool for branching dialogue like ChatMapper? Don’t miss out on the class! You will learn everything you need to create a game with non-linear dialogues and much more! “In this class, we’ll be covering how to use it to add dialogue and player choices to your game. We’ll also discuss linking voice over files to your text, and using a conversation simulator to quickly debug your in-game text without needing to play the game. We’ll implement a few lua scripts to assist in testing our dialogue map (no previous coding knowledge is required), and finally, we’ll export your conversation web in a variety of formats that can be read by any popular game engine. ” – Class Description. More info about the class here! Manage game’s storylines with easy, develop and draft character storylines and entire stories in the planning stages. Non-technical team members can edit stories! You can play Vidar’s demo here. PreviousPrevious post:Storytelling tips from a Disney Pixar veteranNextNext post:Are Video Games the Perfect Storytelling Medium?